The name Tsukiji nowadays brings to mind a bustling fish market in Tokyo, but it was not always so. In the olden days, the area known as Tsukiji was packed with temples, mostly belonging to the Honkan-ji temple complex. . The area was also covered in cemeteries. Along the banks of the Sumida River that flows near Tsukiji, there were also stands selling fresh fish and the sweet sake for children known as amazake. In one story, late every night a woman clutching a child would come to a certain amazake dealer to buy the sweet sake from him, which she would then give to her child to drink. The sake dealer, sensing something mysterious about this woman, followed her from his stall one night and watched her as she made her way towards the main hall of the temple, where she disappeared like a blown-out candle. When she vanished, the sake dealer could hear the cry of a baby coming from somewhere in the cemetery. Tracking the sound to a freshly-dug grave, the sake dealer enlisted the help of some others to dig up the grave, and when opening the coffin discovered a crying baby nestled in the arms of its mother’s corpse. So it is said. I heard this scary story many times when I was a child. And of course, there are many variations of the same story. Kaidan of the child-bearing yurei known as ubume are very old, and yet the story is still widely told in modern times. The basic ingredients of the story have unaltered even as the legend has passed through the years. The ubume legend first appeared in the 12th century kaidan collection called Konjyaku Monogatari, and it is that story I shall relate to you next. 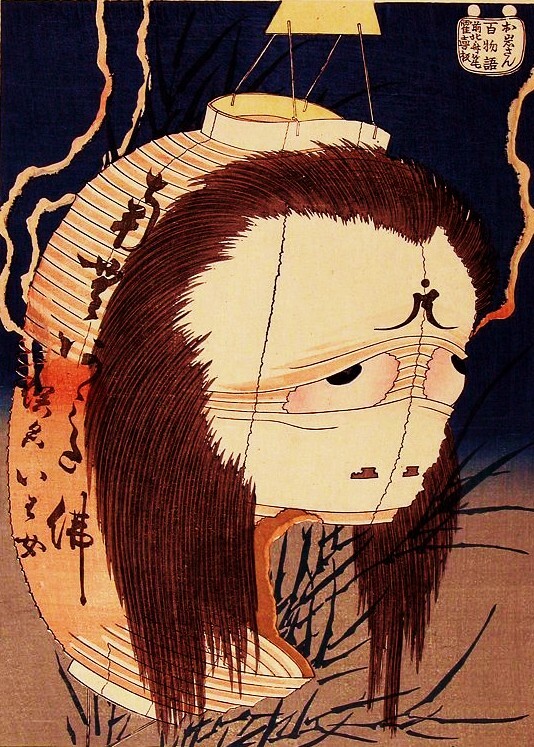 The 17th scroll of the Konjyaku Monogatari is a kaidan scroll, full of ghost legends and monster stories. This particular story is Number 43 from the 17th scroll; the Tale of the Bravery of Urabe Suetake. Urabe Suetake was a retainer of that legendary figure Minamoto no Yorimitsu. More than just a retainer, however, Suetake was one of the Shiten-nō, the Four Guardian Kings whose legend would grow to almost the same size as Yorimitsu’s himself. One this occasion, Yorimitsu and his retainers had made camp near a river-crossing in the old province of Mino (modern day Gifu prefecture). As was common at the time, the soldiers whiled away the night telling weird stories around the campfire, until one man mentioned that this very river crossing was supposed to be the home of an ubume. The legend, it said what that a woman appeared holding a weeping child, and she would plead anyone attempting to ford the river to take the child from her and save its life. Anyone foolish enough to accept the burden would find that child becoming heavier and heavier in their arms, until they were drug under the water and drowned. After hearing this story, all of Yorimitsu’s men were far too frightened to cross the river, but Suetake just laughed and said that he didn’t believe in such nonsense. “I shall cross the river myself. Right now!” he shouted boldly. Standing up and preparing to make his way towards the haunted river, he snatched up an arrow and said he would place it on the far bank as testament to his deed. There were three men in the camp who decided that they would not be satisfied with the evidence of the arrow. After all, he could just fire it across the river! So after Suetake had left, the used the cover of the darkness to silently follow him and to bear witness to his deed. When the arrived, Suetake had indeed crossed the river and placed the arrow, and was now mid-way through his return trip. Suddenly, from the darkness they heard the voice of a young woman, and the unmistakable cry of a baby. 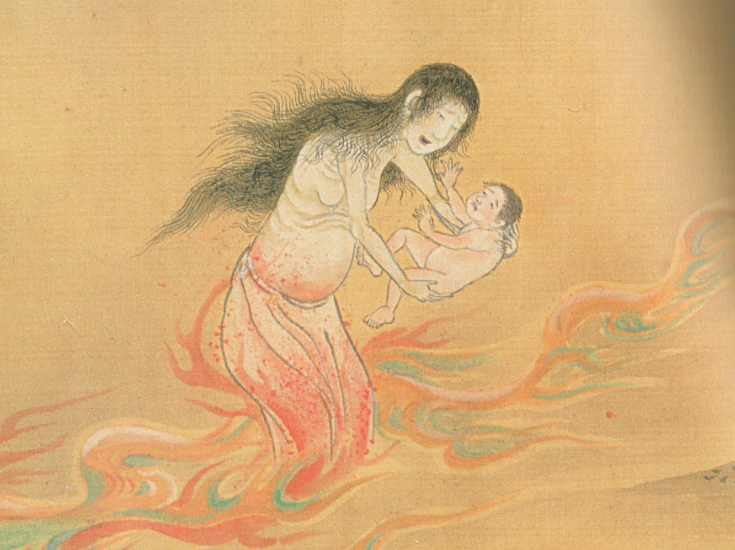 The woman appeared next to Suetake, and begged him to receive her baby and carry it safely across the river for her. In spite of the danger, Suetake bravely received the child and started for the shore. With each step, Suetake’s burden grew heavier, but with his great strength he persevered and it was soon obvious that he would reach his destination. Behind him, the woman screamed in desperation, begging Suetake to return her child to her, but Suetake refused her cries and continued on until he reached the river shore. From there, he headed back to camp with the baby still bundled in his arms. When Suetake arrived in camp, he proudly opened the bundle to show the ubume’s child as evidence of his great deed. Inside, however, there was no baby. Just a mass of wet leaves bundled together in the rough shape of a human child. There is a memorial custom called nagarekanjyou (流れ灌頂). In a small river that runs next to one of the streets in town, four bamboo poles are stood upright in the river, and a red cloth is stretched between them. Next to the cloth and poles a hishaku spoon is placed so that passer-bys can stop and ladle water over the cloth. It is said that when the lettering on the cloth has washed away completely, and the colors have faded, that dead person’s soul is released and can float up to nirvana. It is also said that it is dangerous to catch so much as a glimpse of a nagarekanjyou and not stop to ladle water. This will enrage the waiting yurei who will then follow you home. This custom is most often associated with women who died in childbirth. The Ginza area of Tokyo is overflowing with local legends and gossip. This is one of them. The restaurant itself is no longer standing, but from the Meiji era through the Taisho and Showa eras, the name Tonbo would have been familiar to any residents of the Ginza. The popular restaurant flourished for decades, and appears as a setting in several historical accounts. This is a story concerning the mistress of the restaurant. Now Nezu was a man of strong passions, and one of his passions was for a woman named Mochizuki. Although they were not married, such was their relationship that Mochizuki accompanied Nezu when he took trips abroad. It so happened that, on the day Nezu died in his home, his lady Mochizuki had happened to come calling to his house and discovered his body. The Ginza gossip said that it was almost as if the Buddha had summoned her at that exact moment to tend to her love. To no one’s surprise, it was only a day before Mochizuki too passed away, following Nezu into the afterlife. Nezu must have called for her from the other world, everyone said. It turned out Nezu was not as loyal to his women as he was to his restaurant, for with Mochizuki also dead yet another woman, an employee of an antique shop, came forward as Nezu’s lover and offered to attend to the funeral arrangements as was her duty. Her assistance was not long, as she too soon died and joined Nezu in the other world. With his lovers gone, the obligation of arranging the funeral now fell to the Mistress of Tonbo. Feeling safe that Nezu was well-comforted in death, the Mistress of Tonbo dutifully performed the purification rites and attended at the funeral of her most loyal customer. In spite of this show of affection and duty, Nezu was not content to bring only his two lovers with him to the afterlife. A year had passed, and on January 4th, the exact day of Nezu’s death anniversary, the Mistress of Tonbo also died. Her funeral was on January 8th, the same day that Nezu’s funeral had been held. Some said this was mere coincidence. Now, the Mistress of Tonbo had no children, but she was very fond of costumes and clothing. For reasons unknown, prior to her death the Mistress of Tonbo had already prepared her funerary wear, ordered from her favorite kimono shop. The head clerk of this shop, a woman named Nishi, had been the one to discover the Mistress of Tonbo’s body when she stopped by to pay her traditional New Year’s greeting. Everyone said that the Mistress of Tonbo had foreseen her own death, citing both the preparation of her funerary wear as well as the timing of the expected visit from Nishi. After these events, Nishi of the kimono shop suddenly died. Next up was a man named Koya. An old friend of the Mistress of Tonbo’s father, Koya had often looked after her when she was growing up, and his presence at her funeral was taken for granted. When Koya failed to appear, the Ginza was abuzz with gossip over the reason why, until the day of the funeral Koya’s daughter came to give her regrets and say that Koya too had passed away. Not only had Koya died on January 4th as well, but his own funeral had been held on January 8th, and it was thought that the Mistress of Tonbo had somehow brought Koya along with her to the afterlife. At least that is what everyone believed. I first heard this story from my aunt, but because the legend of the Mistress of Tonbo and her loyal Nezu are so famous almost everyone is familiar with this haunting tale of coincidental death. My aunt could not resist adding a personal touch, however, and whenever she finished the story she would say with a slight smile that there was more to the story. During wartime, such a grand restaurant as Tonbo could not expect to operate, and it was forcibly shut down by the government and its resources re-allocated. The Mistress of Tonbo could not stay idle, however, and in a different location she soon opened a much smaller neighborhood shop. Such was her pride, however, that she could not bring herself to stand in the shoddy booth day-after-day taking customer orders. So the Mistress of Tonbo asked my aunt if she wouldn’t mind coming in and taking over the running of the new shop? To my aunt, this seemed a somewhat mercenary request. The Mistress of Tonbo would collect all the cash while my aunt did all the work. Still, a job was a job, and my aunt mulled it over for awhile. Finally, my aunt decided that she too had pride and that perhaps it would be for the best to recede from the company of the Mistress of Tonbo. My aunt instead recommended Okiku, a girl who had worked at Tonbo restaurant for some time, to stand in as mistress of the new shop. Although disappointed at my aunt’s refusal, the Mistress of Tonbo soon warmed to the idea of Okiku, and it was just a short while before they were in business together. Of course, their little venture was cut short of January 4th of that year when the Mistress of Tonbo suddenly died. And it was only half a year later before it was Okiku’s turn, who found that her Mistress had a pull on her in death as well as life. My aunt dutifully attended Okiku’s funeral, but sure that Okiku would also want to drag someone along with her to the afterlife, my aunt placed two small dolls in Okiku’s coffin. My aunt always bragged that it was she and her little dolls that ended the chain of deaths. In such times of violent war people took such death superstitions seriously. There was no doubt in my aunt’s mind that Okiku had taken her place in more than the restaurant. If my aunt had not transferred that job to Okiku and completely severed her ties with the Mistress of Tonbo, then it would have been my aunt’s cold body lying in that coffin. And surely Okiku would not have been clever enough to think of the two dolls, and the situation would have dragged on even further. Now when you normally hear the story of Nezu and the Mistress of Tonbo, it ends with the death of the Mistress. But my aunt liked to flavor the story with her own personal experience. That is typical of these local legends swapped in the Ginza. Each person twists the details, or emphasizes parts intended to reinforce the moral lesson they wish to tell, or even just to boast of some personal triumph over the supernatural. But if you look back into folklore and history, there is some precedence to the story’s conclusion and the two dolls my aunt says she placed in Okiku’s coffin. The ancient story of Nomi Sukune tells of a samurai who defied the custom of committing ritual suicide in order to accompany his empress into the afterworld when she died. Instead, Sukune placed a set of unglazed clay warrior figures, called haniwa, into her coffin for company. My aunt’s dolls served the same purpose as these haniwa, nullifying the dead person’s curse and satisfying the need for someone to accompany them to the afterlife. In the Northern country, there was a mountain called Mt. Hondo. This is a story of one summer day on that mountain. Up in Mt. Hondo, there was an old pond, where a lone man came to do some fishing. The man had no sooner cast his line than he was pulling up more fish than he had ever seen. In mere moments his bag was full to the brim. That day was terribly hot and humid, and the man dangled his feet into the pond to cool off. The man soon noticed that he was not truly alone. A water spider came dashing at him over the surface of the water. The water spider was covered in black hair and had long spindly legs. While the man idly watched, the water spider began skipping back and forth over the man’s feet. Wondering what the little creature was up to, the man soon saw that the water spider was busy wrapping his big toe up in a web. Before he noticed, the water spider had wrapped first one thing strand, then ten, then a hundred or more tightly around the man’s big toe. The man got annoyed at the water spider’s activities, and took the binding web from off of his big toe and attached it to the root of a nearby willow tree. Just when he was finished with this, he heard the sounds of a rush of water like a wave from over the pond. It sounded like something big emerging from the water. The man grew afraid, and hid himself in the banks of the pond. Suddenly, he heard a deep voice coming from the pond. The voice was coming from the depths of the pond. The man crouched down very small to hide. Without warning, the sides of his bag containing his fish burst wide open. With nothing more to restrain them, the fish from the man’s bag flipped and flopped on the shore, making their way back into the pond. Soon, there was not a fish left above water. The man thought that now was a good time to make his escape, when he again heard the deep voice from the pond. He realized that it was no longer a single voice, nor even two voices or a hundred, but countless voices joined in unison. The voices were chanting together, and it sounded like they were pulling on something. The web was wrapped around the thick root of the willow tree, which was now being pulled with a tremendous strength. Slowly, the thick roots of the willow tree began to be pulled and twisted from the ground, and with a sudden shock the tree itself uprooted and was dragged into the pond. The man had never seen anything like this before in his life. He realized that if he had not taken the web from his big toe and attached it to the willow tree, it would be his own body now being drug under the water of the pond. That thought sent him into a panic, and he sprang from his hiding place and fled swiftly all the way home. From that time on, no one ever went to that pond alone again, and it gained a reputation as something to fear. This is a folktale from the Date region of Fukushima prefecture. In old Japan, there were a lot more water spiders, all though they have become rare with the passing of the years. They were able to live in the water by wrapping themselves in a thin layer of air. It is no wonder that such a mysterious creature would give rise to legends such as this.